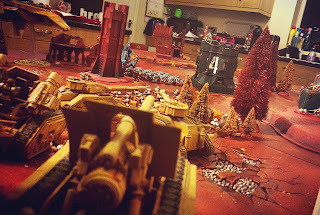 1500pts battle report - Tyranids v Astra Militarum - 8th Edition cherry popped! I've not done this sort of deployment since 5th edition - just massed line ready to cross the killing field and engage. 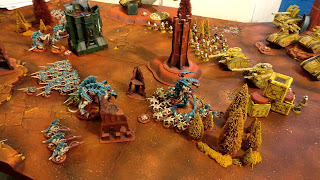 I had a Tervigon, big brood of gaunts, the Swarmlord, a Carnifex, a Biovore, 20 Hormagaunts, 3 Hive Guard and 20 Stealers hiding in a Trygon's tunnel. Ben had all this - whatevs! I drew Supremacy as a card so I Advanced my Hormagaunts to get a 3rd objective and secure the VP. Crazy to see my Advance roll of '6', + their 8" move and they're now 14" up the board! 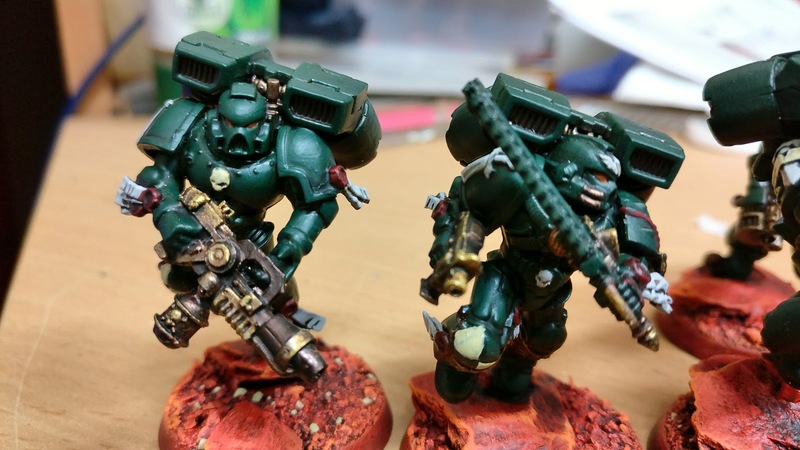 Although in reality they could do that just as well in the old codex - 6" plus D6+3" versus 8" plus D6". 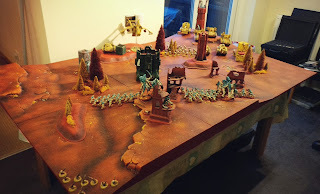 The charge is also different because although you now get the 6" pile in move previously you got to re-roll that charge. Regardless it seemed fast, despite it effectively being less so. 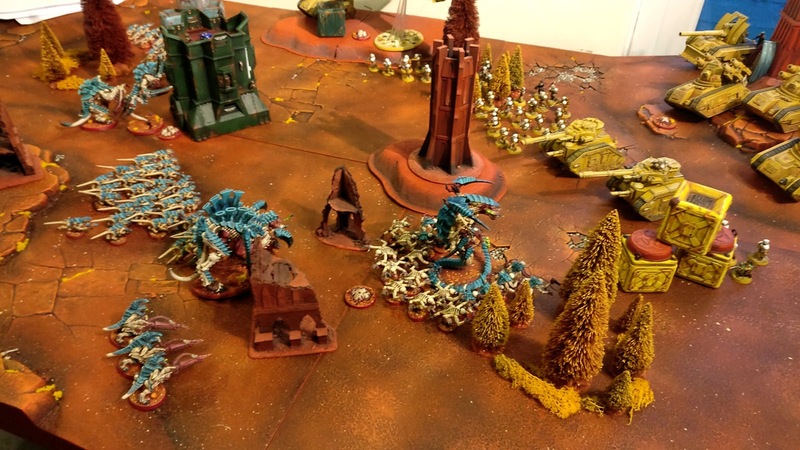 Whereas the Trygon burrowed up and brought in his buddies. Well, who wouldn't try a first turn assault with these things now that we can. Unfortunately the Trygon failed his charge, possibly took a wound or more in Overwatch. But the Stealers made it, swarming forwards and putting 9 wounds on the Leman Russ, from the 14 Stealers we worked out were in range. Meanwhile the Hive Guard managed to wound the Vendetta, I think 5 wounds. I scored a single VP for Supremacy, darn D3! The Vendetta took revenge, whittling down the Hive Guard and wounding the Tervigon. Throughout the game not a single Termagant was attacked let alone killed! So much for their Brood mother boosting their numbers. 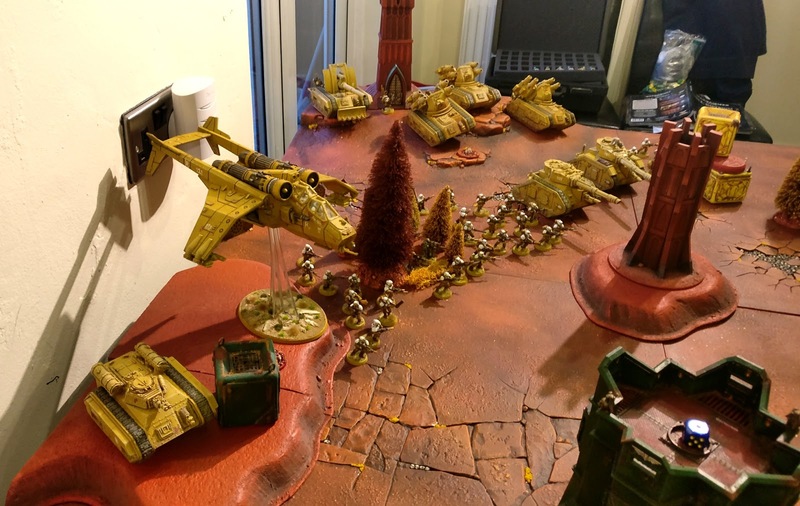 With the Leman Russ falling back the Stealers were left exposed. 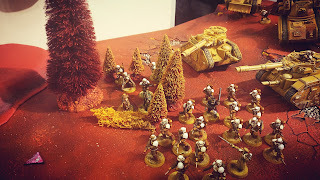 We think we played this wrong but it is our first game and we'll let it slide but the Stealers were completely wiped out thanks to the combined tank fire and rapid firing guard las-guns. To make matters worse there was sufficient firepower left over to remove the Trygon as well - so much for that first turn assault :( Ben walked away with First Blood for the Stealers. Turn 2 and the Hormagaunts assault the Hellhound, I think I did just one wound to it, it had suffered 3 Mortal Wounds off of Smite cast by the Swarmlord. Clearly just because Hormagaunts can wound a tank doesn't mean they should - perhaps I need a better understanding of the right tool for the job. Decimating them all and consolidating into the woods. I think at this point we began to realise that we can't continue to resolve each assault as a separate entity a la 7th, there is a charge phase and a fight phase for a reason, especially as Ben wanted to to use a Command Point to assault first against the Swarmlord. But again as it was our first try we carried on as normal with a view to trying to get it right next time. I came away with Objective 3 and Behind Enemy Lines for 2 VPs. 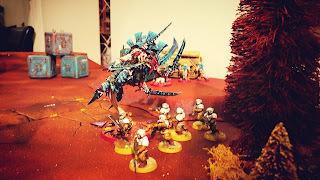 Ben turned his attention to the rampant Swarmlord, with so much fire power at his disposal it was kind of underwhelming when just one Las-cannon did six damage wiping out his remaining wounds for Slay the Warlord. 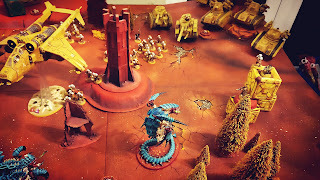 The Basilisk pumped shots into the Tervigon, or the Hive Guard, I think there was just one left in the end. His Ratlings had had enough of the 'not a Pyrovore' Biovore. It had already taken a few out with it's Mortal Wounding Spore Mines. So saw the business end of their Mortal Wounding sniper shots, while they camped in my DZ for Linebreaker. It was midnight and we'd only got to the end of turn 2, I doubt even if that inconsiderate cardiac emergency hadn't had delayed the start *joke* we'd have got more than another turn in. End result was 5:4 to Ben, but the big question is what do we think? I think it's still a bit early to tell for us, a lot of change is clouding our judgement and although there was a lot of dice rolling everything seems to have gone bigger but damage and casualties are bigger too. It's definitely more of a bloodbath but whether we're convinced by it at the moment is irrelevant as this is the edition we've got and we'll have to come to terms with it. 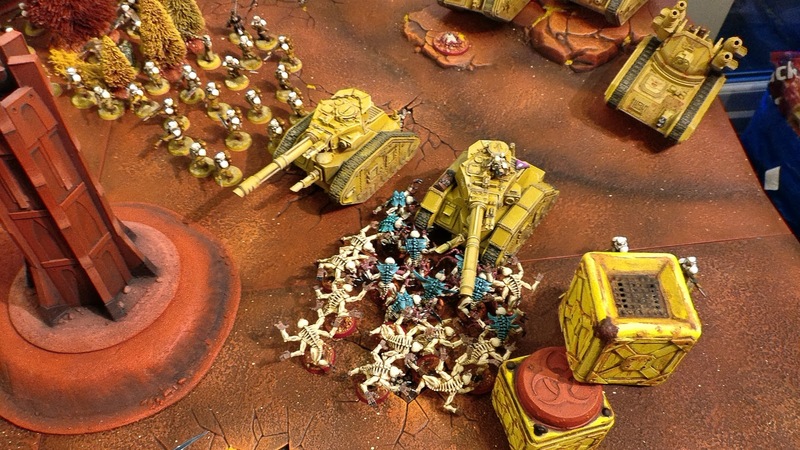 So far though the increase in toughness of everything means those tanks are just so much more durable. Whereas before you got past their armour and they took damage, now they get the armour save just like everyone else, which is quite disheartening when you see those three wounds your feeble little Hormagaunts achieved wiped out without a blink of an eye. 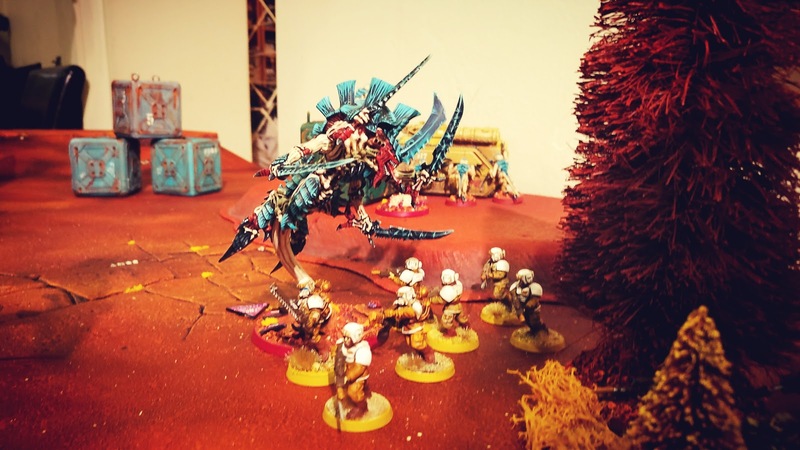 I'm certainly finding the fact nids are no longer Assault weapons across the board a little difficult to keep track of, mainly it's the Hive Guard that suffer this and I suppose they got their extra BS back, although it serves me right for shooting at a Flyer that I didn't feel the benefit. Cover seems a step too far. I'm OK with all cover being just +1 to your save, that's simple, streamlined and reduces confusion. But you only seem to get that if you are in terrain, intervening terrain means nothing. Of course that requires a bit of interpretation but we've already got a precedent of larger creatures needing a % of obscurity to benefit from cover, but again, only if they're in it. We all understand the intervening cover mechanic so I think it should still be in place. I get that +1 to a save seems like a big deal when you're -1AP is having a big impact on survivability so perhaps cover from intervening models makes sense to drop but not having intervening terrain confer a benefit, then what's the point of having it? You may as well have an empty board because the chances are it's only going to help your infantry when they're standing in it and any other terrain will need to be complete LoS blocking to benefit something more than your rank and file. Like I say, it's too early to tell for us, we probably went too big with 1,500pts. I think we'll go smaller next time. 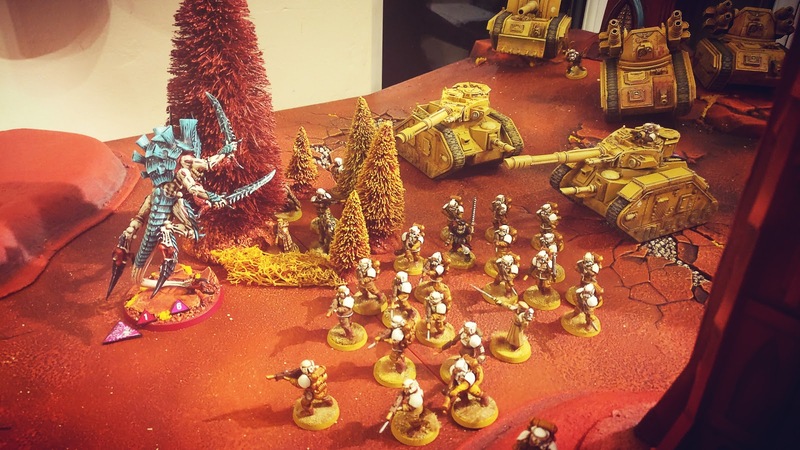 I kind of feel I need a beginner's session like when I used to go to the GW beginner's Sundays. Although some of the reports I've seen online suggest the grasp in-store of the rules can be just as open to interpretation as ours is. Anyway, lets see where we are in a few games time. 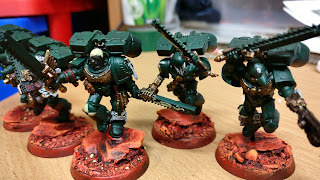 I've cracked on with these, patiently accepting that the next stage of highlighting would be roughly two models a night. It's funny how the very thought of highlighting the green was preventing me even picking them up but at this moment in time offers no such deterrent. Therefore, after the Caliban Green first highlights I applied some Black in all the recess and shading. Really this should have worked with the zenithal application of the Angel Green Army Painter spray but really more black was needed to blend properly and make certain areas more defined. I then followed up with my second highlight. 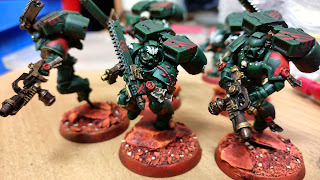 Recently my Bastion and Drop Pod's second highlights were an application of Waaargh Flesh and then glazed to make it more woodland green than olive green. However, I decided to just mix Vallejo Goblin Green with Caliban Green. This gave me the similar shade to the Waaargh Flesh but now in the correct hue, therefore not needing the glaze. Granted the consistency between preparing the mix would be different between each application but you can just about make out the difference are minimal and even match favourably with my Dark Vengeance Tactical guy in the background. I guess it doesn't help to forget your recipe... There's a little more contrast on these, darker in the recess but actually I like that and their poses are more extreme, hence more shadows are warranted. 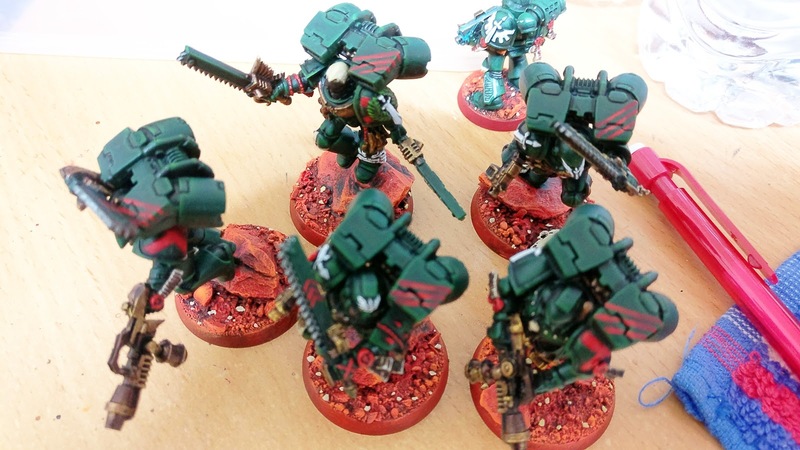 I also picked out the Assault Squad and tribal markings. These need to be shaded a bit but the bulk of the work has been done, even the bases have nearly been brought to completion. 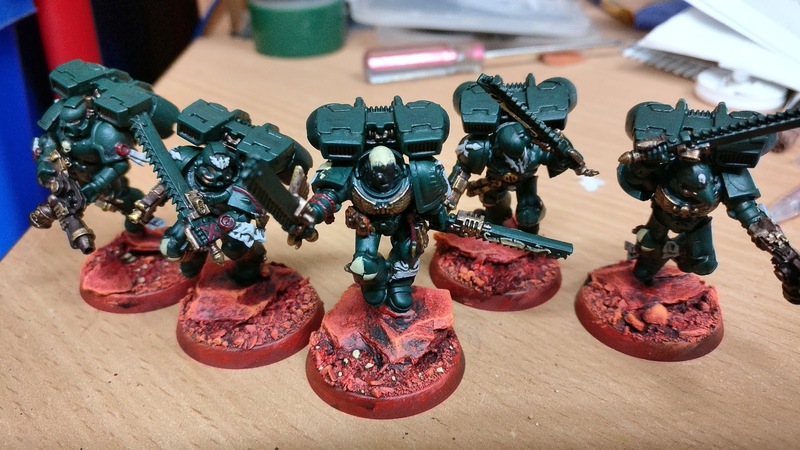 Typically after my last 'What's on my palette' post I immediately found painting the Cultists far too tedious and flitted on to what I'd always expected to be my next project - my Dark Angel Assault Squad. Of course their original reason to be was to fashion the Dark Angel Formaiton allowing me free transports. Of course in 8th those Formations no longer exist! 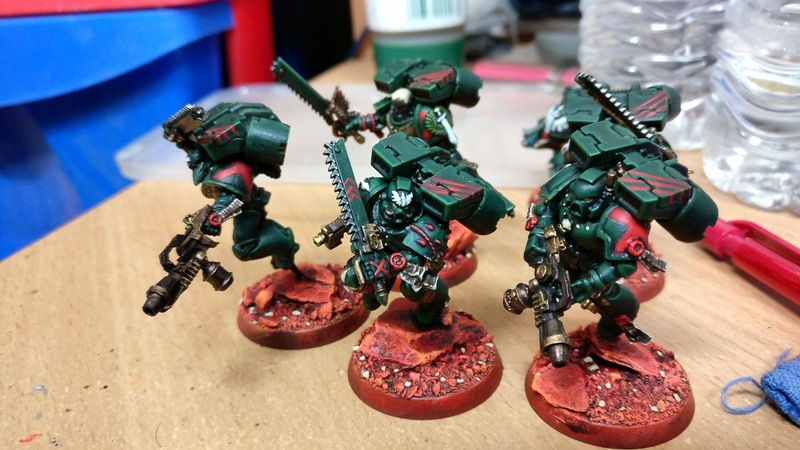 So now the main reason to be is they look cool, but those Flamers are 'winning' in 8th by all accounts, not to mention chainswords being more beneficial. I'd been hesitant to start the Caliban Green as I knew it was a significant part of the process - 30-40 mins each. I know that sounds shocking for a basecoat but I'm just so slow. I did throw in the company colours on the knee and picked up some other elements like washing all the grey and bone parts. Three nights got me to this stage ready to do the next stage of highlights on the green, potentially another three nights. It should be really interesting to see where these are a week hence. I can envisage them potentially completed by the end of June as I don't think there are any challenges beyond the norm. With those out of the way it'll be back to the cultists with no other diversionary projects [I doubt the Razorback/Predator will appeal instead] and I'll be forced to persevere with their completion. 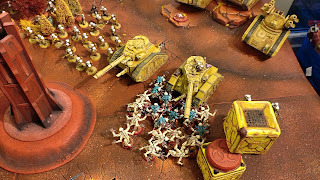 I'd written this post the other day, all complete and scheduled for today and then went to access the permalink information to add to the Battle Reports page and somehow the whole post was converted into a cloned copy of my DT2 game 3 Battle Report. It was a bizarre situation, with the knock on effect I have no real enthusiasm to repeat the original commentary, still I'll offer some captions to make sense of the pics. Best Conversion - Winner Ian Connolly's Top Gun themed Orks, it had the soundtrack playing through hidden speakers too! Don't know where the drill bit comes from but it looks really cool. Best Vehicle/Monster - worthy winner David Irving's Fire Raptor. 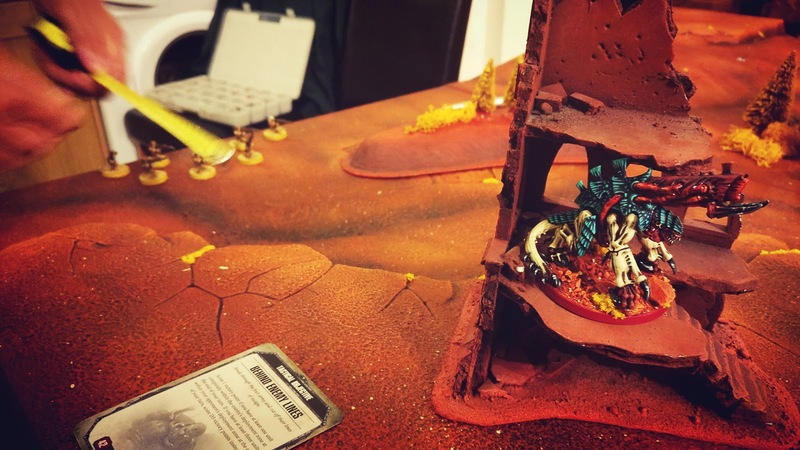 Ian Plumpton's Baal Predator and Mark Hinson's Tau Riptide. Best Army - my own display. Cawl, very tidy, like the varied flock on the base. Love these models, must resist the urge to get some. It's a nice painting event as Alex insists you can only enter one category [to prevent one person running away with everything, *cough* Liam Ainscough] however it does mean you only get a few entries in each category. That means it's good odds if you do enter but does limit choice, not sure there's a solution except for Alex's insistence that everyone try and enter something. 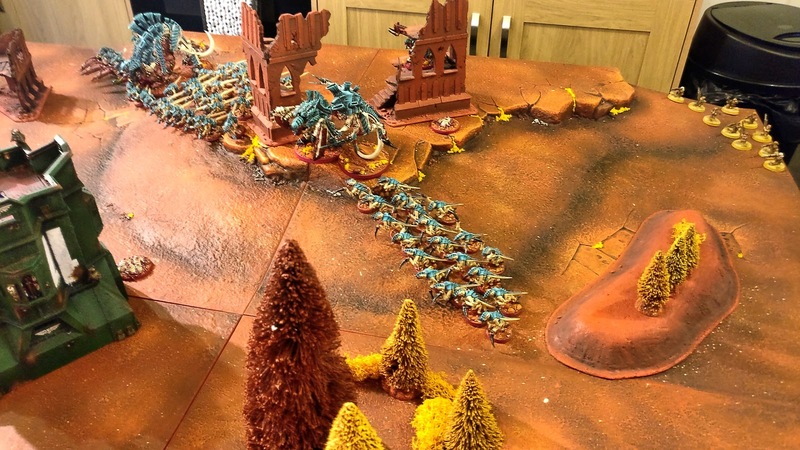 By the looks of it there were only 16 entries across the competition from 28 gamers, maybe some like Hendrik got their army commission painted but I think there's still scope to paint even just one model for this sort of event and enter that. Anyway, congrats to all those who entered and put themselves and their armies on display. I was partnered with Rob Nathan for the final game. His turquoise 'White' Scars were immediately familiar as he attended the Birthday Bash in February so it was nice to be paired together as we hadn't spoken back then. 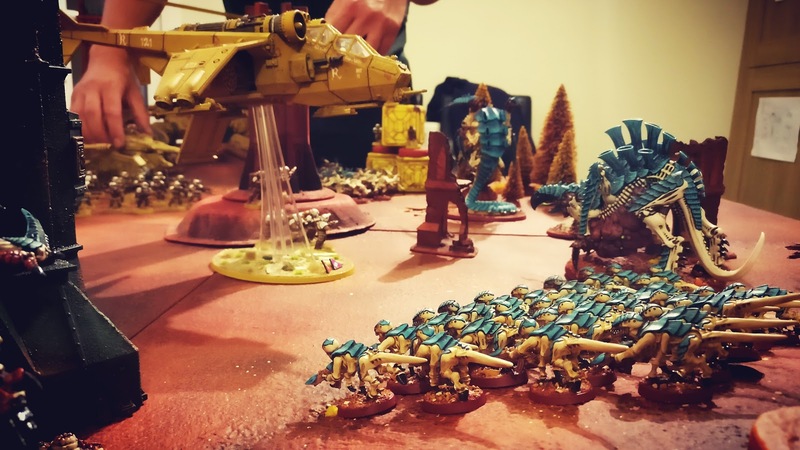 His army was just bikes and attack bikes, with a healthy dose of Grav and a Librarian. 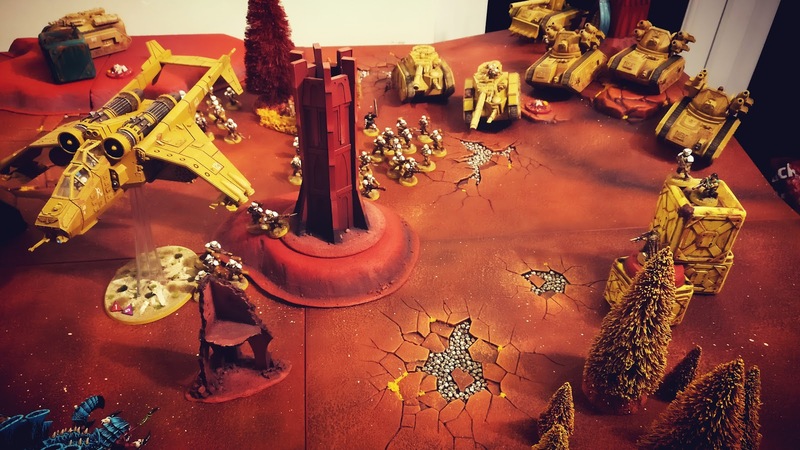 We were up against David Irving's Death Guard and Mark Hinson's Tau. 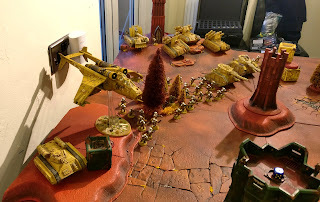 Obviously we know Tau are annoying - their ignores cover was going to make use suffer and the Death Guard, with Typhus in a Kharybdis Assault Claw and a Fire Raptor Gunship - things did not look good for us. OK a week on so my recall is going to be even more shaky. Here's the board, looks likt Kharybdis has arrived. My bikes opposite the Riptide, Rob was backing me up with a unit of bikes and Attack bike on the left out of shot. 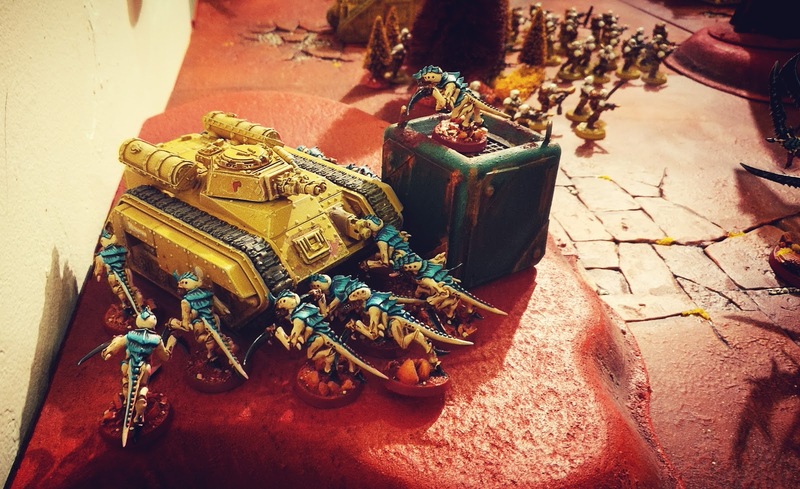 Land Speeders were going to have to face the Assault Claw. But Rob had scattered his forces thanks to my Infiltrate 3 units Warlord Trait, but had coincidentally also forgotten to pin 3 enemy units, exactly what Ben had done. By the end of turn 1 Dan and Mark had scored 2 VPs and we'd got nothing thanks to no numbered onjectives - just killing units which we were struggling to do. 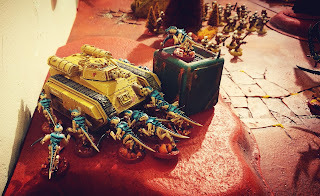 The Assault Claw disgorged it's occupants - Typhus and his guard who were going to chew through my Land Speeders with ease. My Techmarine was in amongst the filth and corruption. He stood steadfast, but one of the Land Speeders was wrecked. 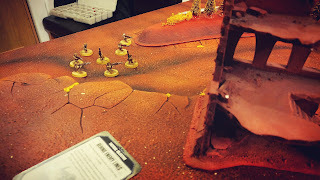 But was overwhelmed by numbers taking first one wound then forced to take another two saves on his 2+ armour. He fell to the foul diseaeased marines, while Typhus assaulted the last Speeder. Which he destroyed with ease. D&M were on 4 VPs by the end of their turn 2. We assaulted with the Attack Bikes. My Dark Talon zoomed on. We socred a VP in our turn. 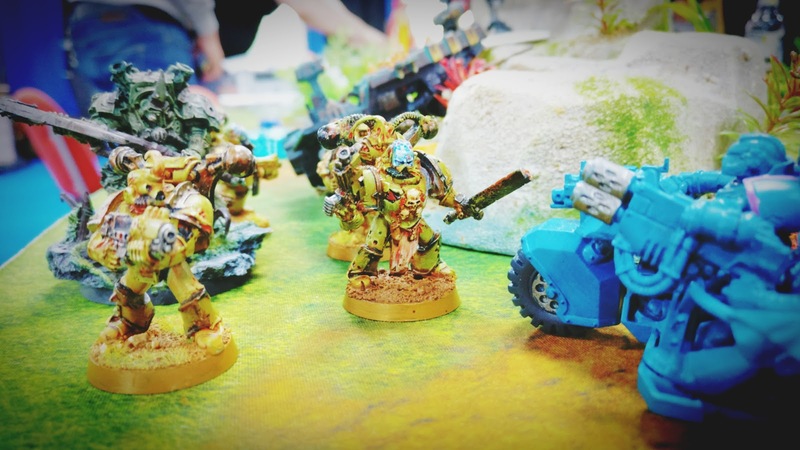 The Attack Bikes turned on the Death Guard but doesn't look like they did any damage and were now in a precarious position. 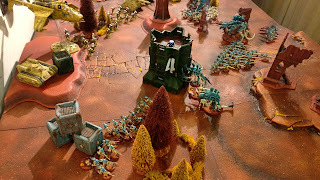 The Assault Claw moved off and by the end of their turn three they'd scored another 5 VPs. Chaos Cultists over-ran my drop pod to contest the objective.. 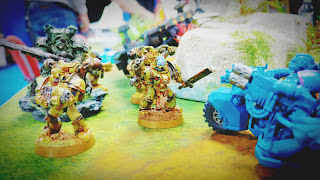 The Death Guard killed the last of the Attack Bikes. and then the last of my Ravenwing. Another 2 VPs to D&M but we pulled two back in our turn, although by this stage all of Rob's White Scars were gone and it was just my remaining Dark Angels left scoring points. 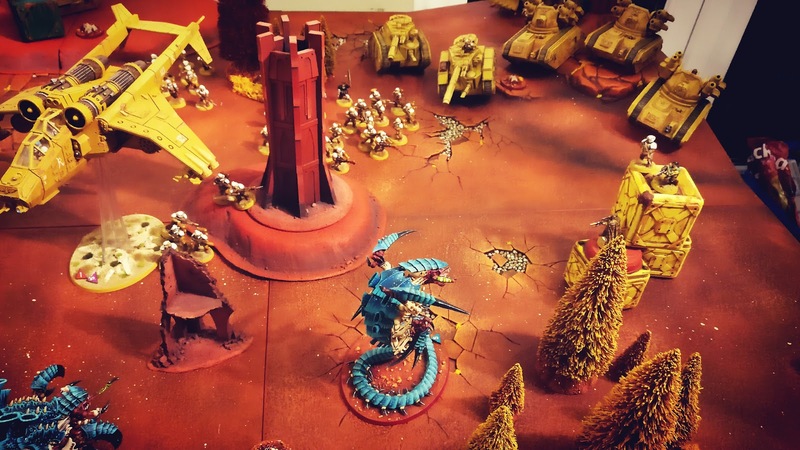 The Riptide started to traverse the battlefield. By the end of turn four it was 11-4 to D&M. They kept my drop pod alive to keep racking up the VPs, I scored none, we rolled for turn 6 and they scored a further 5 VPs that turn. Turn 7 came along and they were able to score another 7 VP. Final score was 32-4, we'd been properly brutalised and only scored 337 Blood Points too. Despite the scoreline I had a really great game, very tactical and these guys were a lot of fun. I think I ended up in 12th place which was a little disappointing given how well I'd started off but ultimately the most important thing for me was just playing games in the company of great people and in that I was definitely a winner! Bring on Double Trouble 3! 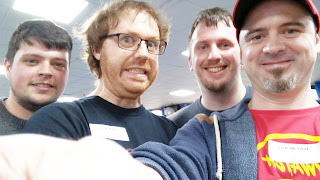 David, Rob, Mark and myself. * Now, Alex did question such a high score, I had been keeping track and dutifully jotted down the scores Dave and Mark had achieved but in review I've definitely noticed one anomally in the scores I was given. Turn 5 was a maximum 9 VPs for holding three objectives for two consecutive turns. If the 9 VPs are correct that means turn 4 should have scored 0 VPs. The objectives were always a gamble, you either scored 1VP or gambled on holding it two turns for 3 VPs. Even if they'd thought they get both and held the three for one turn and also claimed the 9 VPs for two it should have been 3 VPs turn four then 9 VPs turn five so I don't know what was scored. However, if the turn four score is correct, that's either two objectives or 1 objective worth 2, which means they achieved either one or two cards and as you only hold three cards at a time there is no way you can then have held 3 objectives for two consecutive turns for the turn five 9 VPs. Without recording actual objectives scored it's impossible to tell what went on. Bottom line it would have made no difference either way to our result, we were totally outclassed and not for one minute do I think there was anything intentional going on. We were playing really fast so I'm convinced it was an honest error but it does make me think how these things should be more streamlined to prevent this and keep track of what's scored. I usually take notes, I did in game 1 but this fell by the wayside game 2, in future I must be more dilligent.